The German judiciary has referred questions for a preliminary ruling concerning homosexual asylum-seekers to the European Court of Justice (ECJ), more specifically asking whether and to what extent they may lay claim to provisions of protection contained in Council Directive 2004/83/EC of 29 April 2004 on minimum standards for the qualification and status of third country nationals or Stateless persons as refugees or as persons who otherwise need international protection and the content of the protection granted [the 'qualification directive']. The case (C-563/10) concerns an Iranian asylum-seeker, Mr Khavand, who arrived in Germany from Turkey in November 2000 and applied for asylum, claiming to have fled from persecution on account of his homosexuality. His application was rejected in April 2001 and he has since challenged the negative decision on several occasions, the latest with the claim that since his arrival in the Netherlands he has espoused the Christian faith. The new ground for asylum was also rejected with the argument that “converts” in Iran are only persecuted if they carry out “missionary” activities. As for his homosexuality, the German authorities argue that he should not face any persecution as long as the Iranian authorities do not know about it. They have also dismissed his fears about being flogged or subject to the death penalty, insisting that he should have no problems in his home country as long as his homosexuality experiences are not shown openly. depending on the circumstances in the country of origin, a particular social group might include a group based on a common characteristic of sexual orientation. Sexual orientation cannot be understood to include acts considered to be criminal in accordance with national law of the Member States: Gender related aspects might be considered, without by themselves alone creating a presumption for the applicability of this Article”. To what extent is homosexual activity protected? Can a homosexual person be told to live with his or her sexual orientation in his or her home country in secret and not allow it to become known to others? Are specific prohibitions for the protection of public order and morals relevant when interpreting and applying Article 10(1)(d) of Directive 2004/83/EC or should homosexual activity be protected in the same way as for heterosexual people? Some of the questions have already been answered, referring not to the afore-mentioned EU Directive but to refugee law in the UK. 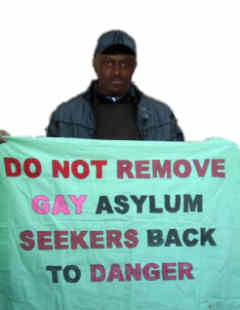 The reasons given by the British authorities for turning down the applications of asylum-seekers claiming persecution on account of their homosexuality were almost identical: there was nothing to fear as long as they behaved discretely and did not exhibit their sexual orientation in public. On 7 July 2010, five Supreme Court judges in the UK ruled unanimously that obliging homosexuals to hide their sexual preference in order to avoid persecution amounted to a violation of their fundamental right of freedom of association with people of the same sexual orientation. Lord Rodger, one of the five judges, declared that homosexual asylum-seekers must be “free to enjoy themselves going to Kylie concerts and drinking exotically coloured cocktails” without fear of persecution. He added that they should have the same rights to display their sexuality as heterosexual men who “play rugby, drink beer and talk about girls with their mates”. “The question is how each applicant, looked at individually, will conduct himself if returned and how others will react to what he does (…) he cannot and must not be expected to conceal aspects of his sexual orientation which he is unwilling to conceal, even from those whom he knows may disapprove of it”.